This is a post from the website http://anarchistnews.org/ which has some interesting content (its tagline reads The goal of anarchistnews.org is to provide a non-sectarian source for news about and of concern to anarchists). Note: Please be careful when reading the comments as they range from insightful to depressing (or avoid them altogether). And after the article I posted a very brief intro-bio and links for more information on Bakunin. This article demonstrates the ridiculousness of state surveillance, and also how pervasive it is internationally (which is also a concern and issue to be smart about with one's practices). Note from El Libertario: Of everything that has been said and written about the Russian anarchist this year which marks two hundred years since his birth, we are quite certain that for him the most precious would be the involuntary homage paid by a surprising source: none other than the cops of Río de Janeiro, who included him recently in the dossier of subversive persons who must have a close eye kept on them. A report on this particular matter–which we have translated from the Portuguese–appears in the following paragraphs. We suppose someone–not ourselves–will have to thank the repressive forces for such a valuable record on the surveillance of Mikhail Bakunin. An Article published on Monday 7/28/14 in the Folha daily of S. Paulo includes a revelation curious to say the least: the legal summary of over 2,000 pages–elaborated by the Civil Police of Río de Janeiro in order to accuse 23 persons as responsible for the organization of violent actions in the recent street demonstrations–mentions the philosopher Mikhail Bakunin as a suspect. Dead since 1876, the Russian is considered one of the fathers of anarchism. According to the document, Bakunin was cited by a demonstrator in a message intercepted by the police. From there he went on to be classified as a “possible suspect.” Professor Camila Jourdan, 34 years old, one of the persons under investigation, mentioned this episode in order to demonstrate the fragility of the accusation. “From what little I’ve read, I can say that this legal summary is a work of fantasy literature of the lowest quality,” she said. Jourdan spent 13 days imprisoned in the penitentiary complex of Bangú in western Río. Known for her academic excellence in the State University of Río de Janeiro (UERJ), where she coordinates the postgraduate program in philosophy, she says she is a victim of the devices of the investigative police. “There is a need to fabricate supposed leaders for these demonstrations. And who fits well the role of intellectual mentor? The university professor. It fits like a glove, you see?” she said. Translated [to Spanish] by the editors of El Libertario. (below is an excerpt from longer biographical entry about Bakunin from http://en.wikipedia.org/wiki/Mikhail_Bakunin)- "Mikhail Alexandrovich Bakunin (Russian: Михаил Александрович Бакунин; IPA: [mʲɪxɐˈil ˌbaˈkunʲin]; 30 May [O.S. 18 May] 1814 – 1 July 1876) was a Russian revolutionary anarchist, and founder of collectivist anarchism. He is considered among the most influential figures of anarchism, and one of the principal founders of the "social anarchist" tradition. Bakunin's enormous prestige as an activist made him one of the most famous ideologues in Europe, and he gained substantial influence among radicals throughout Russia and Europe." 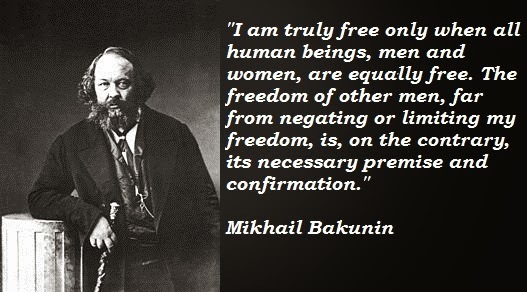 More about Mikhail Bakunin is at http://flag.blackened.net/revolt/anarchists/bakunin.html (biography and writings) and http://en.wikipedia.org/wiki/Mikhail_Bakunin (from wikipedia) and http://theanarchistlibrary.org/authors/michail-bakunin (many writings from anarchist library) and http://anarchism.pageabode.com/anarcho/the-revolutionary-ideas-of-bakunin (site dedicated to anarchist writers).